I grew up eating fruit salad with every dinner, so now I crave it pretty consistently. Particularly in the winter, my body wants that extra vitamin C. However, at least in these parts, it can be hard to find a wide variety of good, fresh fruit in February. I came up with this fruit salad to address that issue. It was conceived with a firm belief that cinnamon makes just about anything taste even better. The last time I got this salad together I had also cooked up a big batch of steel cut oatmeal. I served them separately, but my friends got the brilliant idea to put the fruit salad over the oatmeal. It made for a delicious, hearty, wintertime breakfast that kept us full during a long walk in the woods. Cut the apples, pears, and clementines up into roughly 1” cubed pieces. 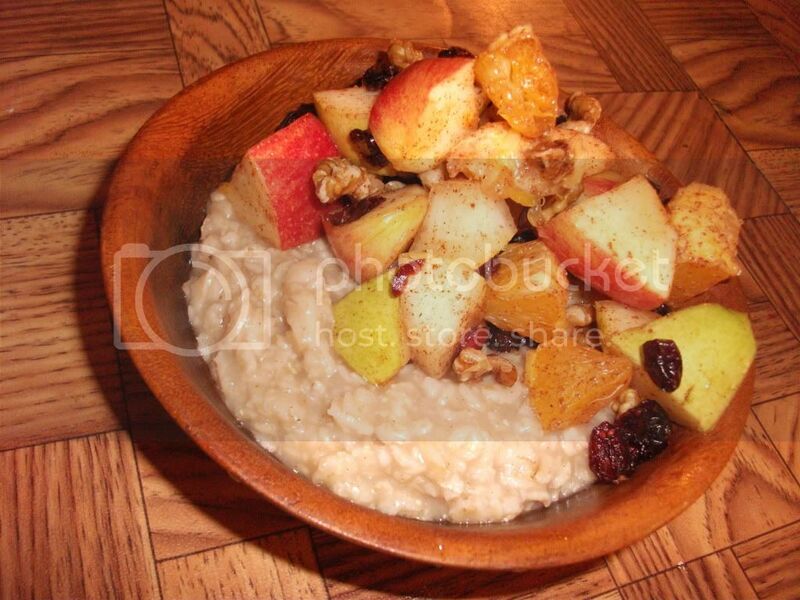 Put the cut fruit, chopped walnuts, and dried cranberries in a large bowl. Pour the orange juice over the mixture and stir to combine. Sprinkle the powdered cinnamon over the salad, and stir until all the fruit is well coated. Bring the water to a brisk boil in a large pot. Sprinkle in the steel cut oatmeal, and stir well for 5 to 10mins. Reduce heat, add vegan butter, and let simmer for 15mins. Pour in 1c of soy milk. Stir well, and let simmer for 10mins. Add another 1c of soy milk, and stir until thick. Remove from heat, and stir in the brown sugar.